Tuition fees increased for both undergraduate and graduate students for the 2018/2019 academic year. However, the actual cost that students pay varies depending on the grants and financial assistance they may receive. Tuition for undergraduate programs for Canadian full-time students was, on average, $6,838 in 2018/2019, up 3.3% from the previous academic year. The average cost for graduate programs was $7,086, a 2.4% increase over 2017/2018. While these tuition fees are reported in current dollars, they remain relatively stable when inflation is taken into account. The average tuition fees reflect both the variety of degree programs offered by institutions and the proportion of students enrolled in these programs. As a result, even if there are no changes in specific program tuition fees, the average tuition could change if new programs are added, or if the distribution of students across programs changes. Across Canada, the increase in undergraduate average tuition fees for 2018/2019 ranged from 0.1% in Alberta to 6.5% in Manitoba. Tuition fees for Canadian graduate students increased in seven provinces, ranging from 2.0% in British Columbia to 6.5% in Manitoba. Canadian graduate tuition fees were unchanged in Alberta and in Newfoundland and Labrador, while they fell by 0.8% in Prince Edward Island. The increases in Manitoba were the result of the provincial government allowing institutions in the province to increase fees by up to 6.5% in 2018/2019. The results of the survey of Tuition and Living Accommodation Costs do not necessarily reflect the cost students will pay, as there is an assortment of non-repayable financial support available, and this can vary across institutions and provinces. For example, scholarships, bursaries, government grants, and tax credits can decrease the actual amount that students pay. According to the 2010 National Graduates Survey, almost two-thirds of students who graduated with a university degree had received such non-repayable financial support. The most costly average tuition fees for Canadian undergraduate students in 2018/2019 were in dentistry ($23,474), followed by medicine ($14,780), law ($13,332) and pharmacy ($10,746). These four programs accounted for 3.6% of all Canadian undergraduate students. Almost 60% of Canadian undergraduate students were enrolled in one of four fields of study: social and behavioural sciences, and legal studies (not including law); business, management and public administration; physical and life sciences and technologies; and the humanities. Tuition fees across these fields of study varied by province, with fees in the humanities lower than or similar to the tuition fees for the other three fields of study for Canada overall, and for most provinces. In social and behavioural sciences, and legal studies (not including law), the average undergraduate tuition fee for full-time Canadian students was $5,893. The fees ranged from $2,550 in Newfoundland and Labrador to $7,162 in Nova Scotia. Undergraduate tuition fees in business, management and public administration were lowest in Quebec ($2,792) and highest in Ontario ($10,570). In physical and life sciences and technologies, undergraduate tuition fees were above the Canadian average of $6,395 in four provinces: Nova Scotia, New Brunswick, Ontario and Saskatchewan. 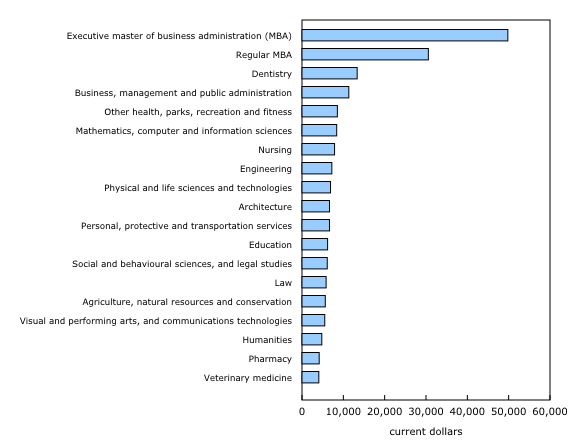 At the graduate level, the most expensive programs remained the executive and regular masters of business administration (MBA) programs. Average tuition for an executive MBA was $49,798 in 2018/2019, while the fee for a regular MBA averaged $30,570. These averages at the Canada level reflect the broad range of fees among the provinces that offer MBA programs. Average tuition fees for regular MBA programs ranged from $2,382 in Newfoundland and Labrador, to $44,759 in Ontario. Prince Edward Island started offering a new regular MBA program, which cost an average of $20,000 in 2018/2019. Dentistry ($13,343) had the third-highest average tuition fees for graduate programs at the Canada level, followed by business, management and public administration ($11,323). Additional compulsory fees vary by institution and can change over time. These fees apply to all Canadian students, regardless of field of study. Typically, they include fees for athletics, student health services, and student associations. Nationally, additional compulsory fees for Canadian undergraduate students were, on average, $921 in 2018/2019, up 4.2% from the previous year. For graduate students, average additional compulsory fees increased 3.6% to $875 in 2018/2019. Across Canada, the average tuition fees for international undergraduate students rose 6.3% in 2018/2019 to $27,159. Two-thirds of international students were studying at the undergraduate level. Of this group, 30% were enrolled in business, management and public administration, with an average tuition fee of $26,395, which was slightly below the national average for all fields of study in 2018/2019. On the other hand, 14% of international undergraduate students were enrolled full time in engineering, which had above-average tuition fees of $30,742. Average tuition fees for international students in graduate programs rose 1.0% to $16,497. Graduate tuition fees increased in every province except Ontario (-2.4%). The decrease was driven by a restructuring of tuition fees at the University of Toronto, with most international PhD students paying tuition fees equivalent to those of domestic students. In Newfoundland and Labrador, the average tuition fees for international graduate students increased by around 30%, the result of an equivalent increase in tuition for new international students effective September 2018. Data presented in this release are from the annual survey of Tuition and Living Accommodation Costs (TLAC). The survey covers all public degree-granting institutions (universities and colleges) in Canada; that is, those that offer programs leading to degrees as defined by the Canadian Information Centre for International Credentials: bachelor's degrees, applied (bachelor's) degrees, applied master's degrees, master's degrees and doctoral degrees. 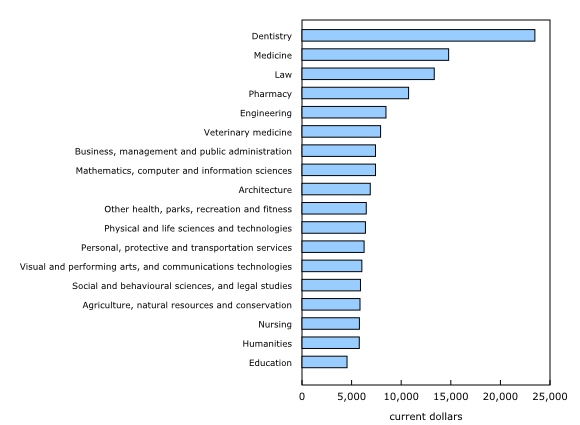 These degrees are more commonly offered by universities, but may also be offered by colleges. Canadian students, including Canadian citizens and permanent residents, are reported separately from international students. The survey was administered from April to June 2018 and data cover the 2018/2019 academic year. Data for 2018/2019 are preliminary. Any required changes will be applied to the 2019/2020 data release, when the 2018/2019 data become final. Although tuition fee increases are generally regulated by provincial policies, some programs may be exempt from these policies, resulting in possible rises that exceed provincial limits. Tuition fee averages may vary from year to year because of changes in the structure of and fees for programs. National and provincial tuition fee averages are weighted with 2015/2016 student enrolments using the Postsecondary Student Information System. If the number of enrolments for a given program is unknown, that program is excluded from the averages. The same student enrolment figures are used for weighting both academic years (2017/2018 and 2018/2019), thereby allowing a comparison of changes in tuition fees. Masters of business administration programs have been excluded from the national and provincial weighted averages to eliminate the effect of the high cost of these programs on the overall tuition fee averages. Dental, medical and veterinary residency programs offered in teaching hospitals and similar locations that may lead to advanced professional certification have also been excluded. In Newfoundland and Labrador, undergraduate and graduate tuition fees were frozen in 2018/2019 for all Canadian students except for new out-of-province students who incurred a 30% increase. These students represent approximately 10% of the domestic student population. This increase is not reflected in the TLAC results. As the distribution of enrolments across the various programs varies from period to period, caution must be exercised when making long-term historical comparisons. Figures on enrolments are from the 2015/2016 Postsecondary Student Information System. The fields of study are adapted from the 2011 Classification of Instructional Programs, Statistics Canada's standard for the classification of instructional programs. Data in this release do not take into account financial assistance or tax rebates provided to students.